Italian designer Massimiliano Della Monaca is the brain behind this creation. It is covered with precious glass mosaic in a style that stands out from the rest of the traditional geometric shapes. 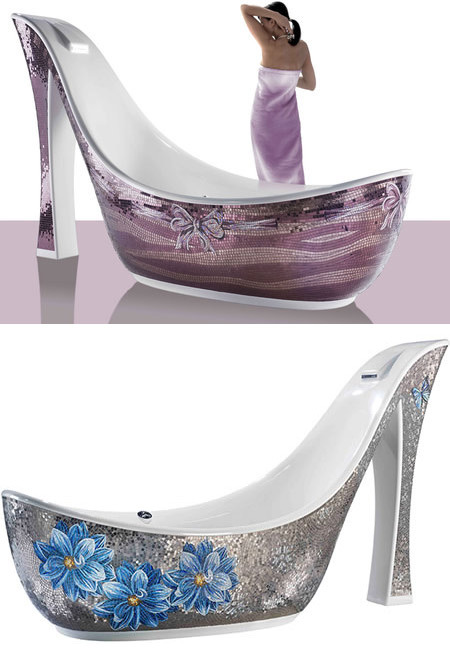 Shaped like an elegant pump shoe with a skyscraper heel, it allows for a perfect soak. It costs "just" $17,000. 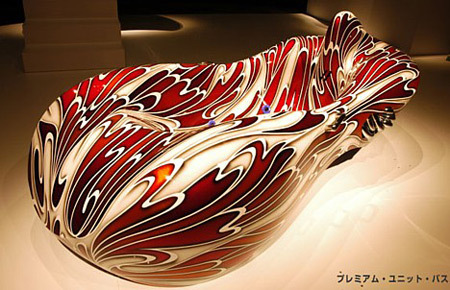 Designed by artist Tetsuya Nakamura, this fabulous design costs $26,000. According to the accompanying disclaimer, Nakamura's heavy emphasis on form — and relative disregard for function — means bathers should enter the tub at their own risk, as the artist and dealer assume no responsibility for injuries or accidents that may occur. 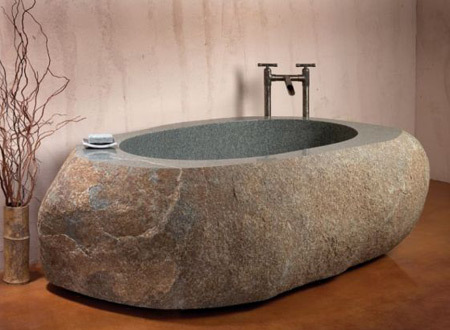 Stone Forest makes some amazing bathtubs and sinks. Basically they take a giant rock and hollow it out. The end result is, as you can see, stunning(ly heavy). 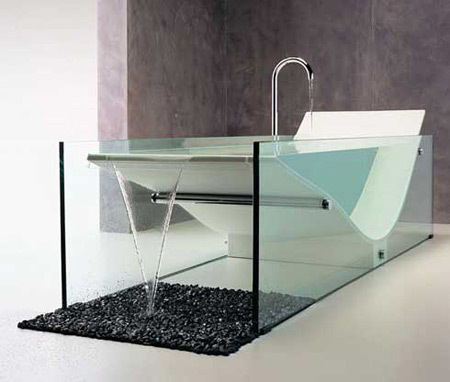 It would be very cool to have a bathroom designed in such a manner that this sort of tub fit in. 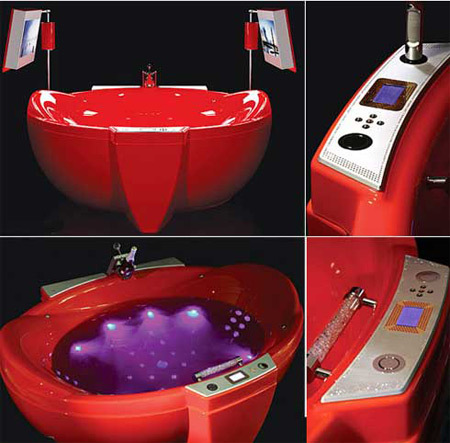 This Red Diamond bathtub is probably the most expensive bathtub ever made, and has pretty interesting elements. Its features include two waterproof HDTVs, GSM remote control, console with massive gold frame (42 g 18 k) and Swarowski crystals. The most amazing part? The price, which is no less than $47,200. The Stone One leather skirting bathtub from Aquamass has a traditional, clear-cut shape that leaves the tub open to a wide range of highly decorative finishes. The simple oval shape of the tub is easy to customize with surprising exterior finishes to express aspects of the owner's personality. Pictured above is a daring zebra printed finish from the Just Animals collection. The price? Only EUR €10,950. 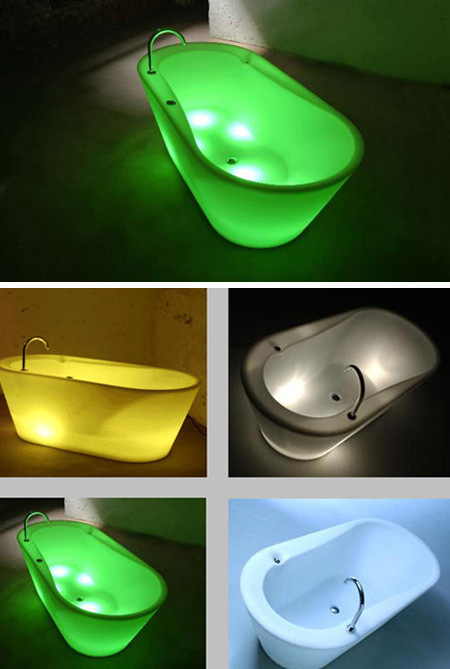 This self standing, polyethylene, illuminated bathtub, comes with a set of installed halogen lights, or as an option, an internal multicolored programmable LED light unit. Comes in colors of white, flourescent orange, lemon yellow, pink, and red. Cost: $1,399 (add $2,499 if you want the LEDs) . Created by desinger Jan Puylaert. 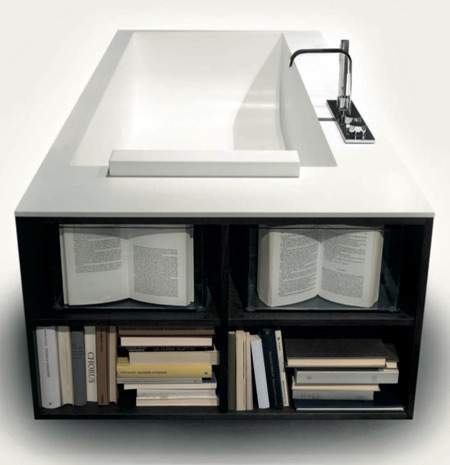 Biblio, an innovative bathtub design project by Antonio Lupi, was especially designed for a book addict, featuring a book case at the back side. 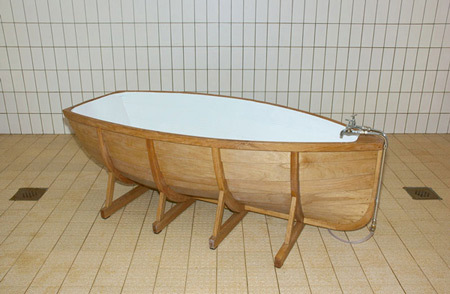 This bathtub was made of resin and wood. 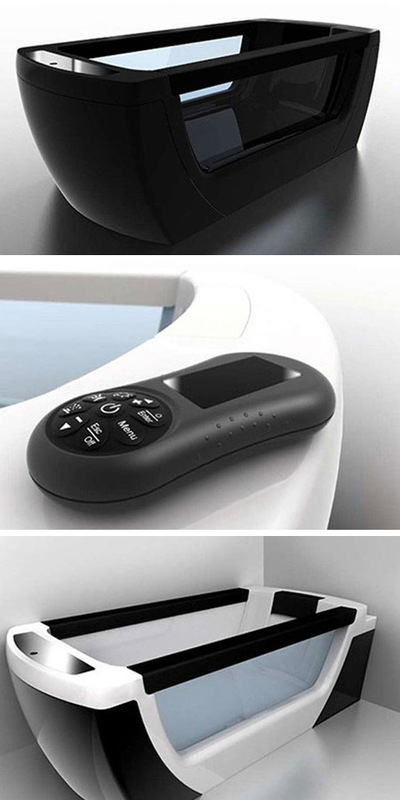 If you are interested in this bathtub, we should ask you to consider the amazing price: $17,300, wow! 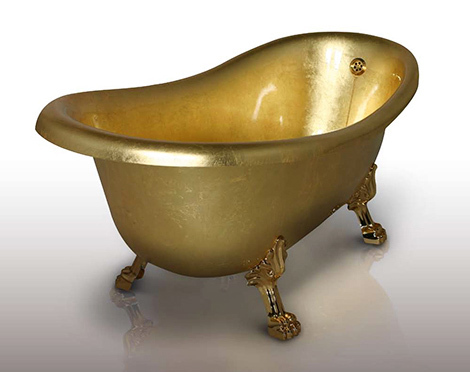 This stunning bathtub that belonged to a Japanese hotel chain was made of 18-karat gold and stainless steel. The 71-centimetre (28-inch) long tub weighs 80 kilograms (175 pounds) and has an estimated value of 120 million yen (one million dollars). In 2007 it was stolen from the resort. Whether at home or residing at a beautiful resort, bathing is the ultimate relaxation. At the forefront of the Omvivo range of baths is the signature Le Cob. The design which pays homage to Le Corbusier's Chaise lounge creates a unique bathing experience. This piece by the Dutch designer Wieki Somers is so ironic and beautiful. Somers actually states that "floating on the water and bathing in the water deal with so much similar feelings and elements that they are combined in one installation." By turning a small boat inside out it becomes a bath. 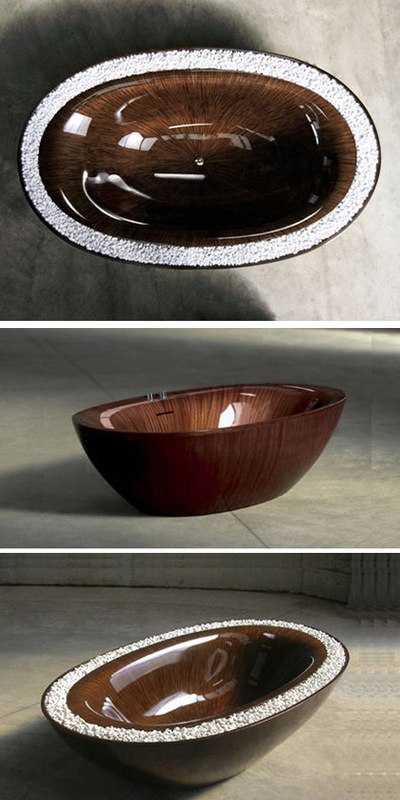 Dedicated yacht makers inspired by the beauty of marine woods, Laguna creates glamorous wooden bathtubs which shine like jewels. The warm dark wood is given a soft sculptural form and modern elegance.